Mount Celebrates Martin Luther King Jr. by Questioning "Where Do We Go from Here?" 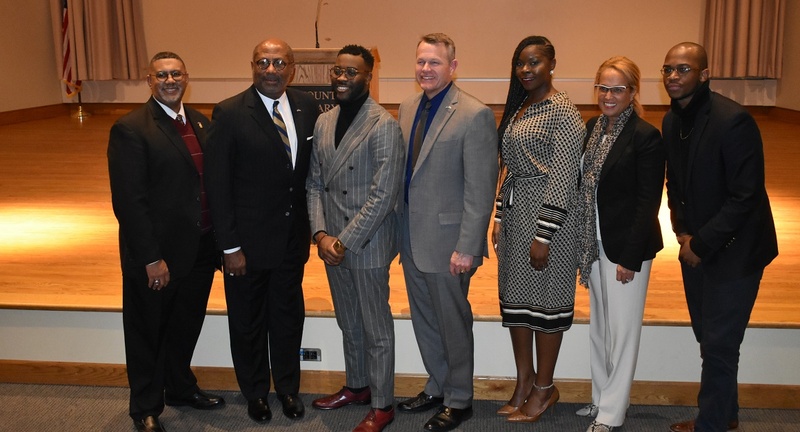 Pictured with keynote speaker Richard Lucas III (third from left) are Christian Minister Dwayne Brown, Vice President for Student Life Bernard Franklin, President Timothy E. Trainor, Center for Student Diversity Assistant Director Stephanie Durr, Vice President for Equity and Success Paula Whetsel-Ribeau, and student Michael Gunn, C'21. 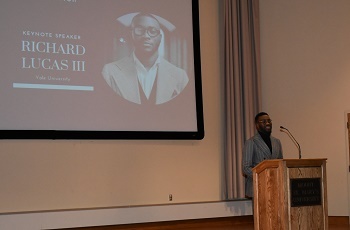 Lucas provided several rapid-fire examples of the highs and lows of the current crossroads—the opening of the National Museum of African American History and Culture versus the dismantling of the Voting Rights Act of 1965 through court decisions as well as the seating of the most diverse Congress in 2019 versus an Iowa congressman defending white supremacy last week. Lucas, who is in pursuit of his Master’s degree at Yale, is also the William Sloane Coffin Fellow, a full scholarship award given to one student in every incoming class who demonstrates Coffin's prophetic leadership, his passion for social justice, and his critical theological interpretation of the social and political scene. He earned his undergraduate degree at Bowie State University.